Right now you’re probably working hard at your online business or you’re still trying to figure out what you should do. Your #1 objective is to make profits. Nothing more. Sure, there may be other aspects you enjoy about it all, including being able to help people or even the creative process itself, but bottomline you want to make money. For the past 13+ years I’ve sold over 7-figures online selling all kinds of stuff on my own through services, ghostwritten guides, and more. I’ve had years where I pulled in over 6 figures per year, and others where I pulled in a fraction of that. That’s the cycle one has to deal with when being an online entrepreneur. The playing field changes fast. It just comes with the territory. Now as I look back on the concept of money, I’ve realized that money is more than just currency. If you think about it, you either trade dollars for hours (time for money) or if you’re lucky enough to generate passive income streams in your business, you get to let money create more time (money for time). Money is simply a representative of time, in one way or another. When you trade dollars for hours, the ability to scale is limited. Plus, it can eat away at your time and freedom to live the life you want. 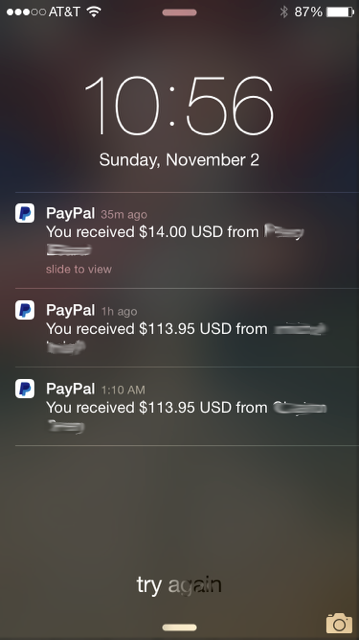 When you create passive income, not only can you scale but you gain more freedom. This means you can wake up to emails or alerts of payments while you are sleeping (see screenshot). I don’t know about you, but my #1 goal is to make the majority of my income as passive as possible. I’m not a fan of trading dollars for hours. I’m a fan of creating something once, and selling it over and over again with online “systems”. When you look at your business and profits, how do you view money? Are you setting yourself up the way you want when it comes to earning profits, or are you grinding away at it? And the next time you hold a dollar in your hand that you earned with your business…think about what it took to earn that dollar.